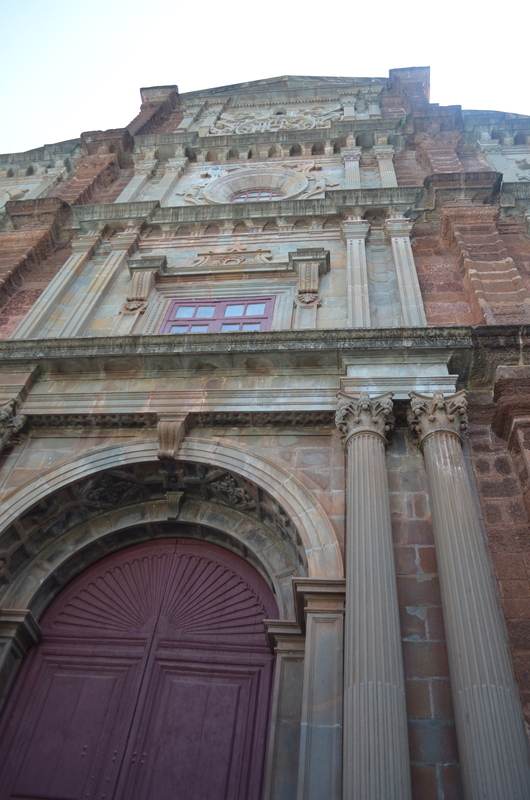 Old Goa houses many cathedrals including the Basilica of Bom Jesus, a UNESCO World Heritage Site. Built in 1594, the Basilica holds St. Francis Xavier’s body elevated in an encased silver casket. It is said that every ten years, this casket is lowered for devotees to pray next to. St. Francis Xavier arrived in Goa in 1542 with the intention of restoring Christianity to the Portuguese settlers and their illegitimate children. He began a Jesuit hermitage and after three years of catechizing children, he traveled to Indonesia to carry of with his work. We arrived by bus close to Basilica of Bom Jesus during the morning and walked to the Basilica in the hot morning sun. We could hear the singing of Christian songs as we approached from a block away and as we got closer, we could see a canopy or tented area that had been set up outside the cathedral where hundreds of people had gathered. After a relaxed security check, which confirmed that our knees and heads were covered, we went through the main entrance of the cathedral to find many people lined up to take communion. The main alter was gilded in gold filigree with angels and depictions of St Xavier’s life. Many people were actively praying on in pews while tourists were snapping shots. The feeling inside was very different than the singing outside where the service was taking place. In some ways it seemed almost “busy” and impersonal and I found myself feeling conscious of turning on my recording device. 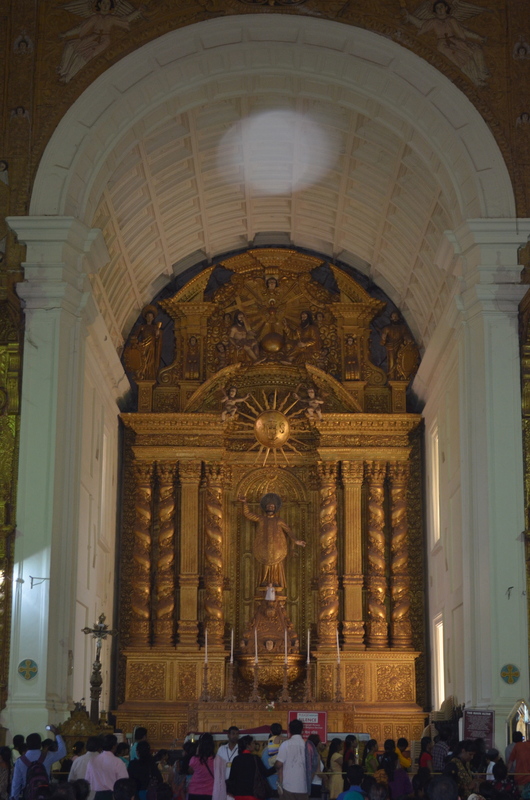 As I settled in though, listening to the Basilica of Bom Jesus, watching how the sunlight flooded through the side windows, the coolness of the pew beneath me, the soaring arch of the high baroque architecture, the feeling of the cathedral’s intention began to wave through me—the glory of God. It was our final day of our residency in India. We had spent the day presenting our chapters of Popular Culture in a Globalised India and then watched / listened to the famous speech Martin Luther King, Jr. had given, “I have a dream.” We learnt that our professor, Michael R. had been present for this infamous speech all those years ago. He described his circumstances around the event and when we watched, I found that was not alone as tears welled up in me—the connection between Gandhi and Martin Luther King’s vision of a free people, working in harmony and creating the change we wish to see in the world resonated loudly as the speech came to a close. It was a kind of silence you never want to leave for to break it through movement or words shatters the purity of the moment. It was like listening to the most beautiful piece of music—in that hushed moment before applause lies the whole lived experience of it, pregnant with possibility. We left our classroom to spend free time and planned to meet up for our final dinner together. 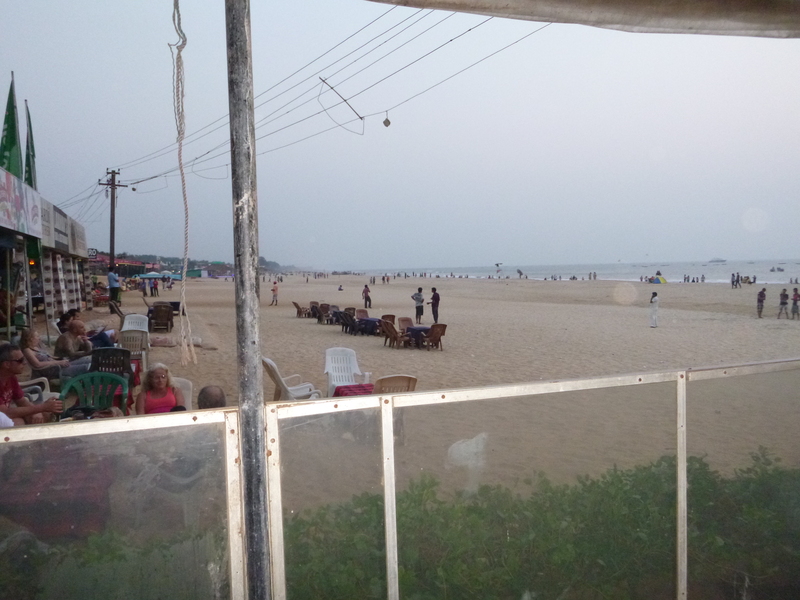 I took the shuttle bus provided by our hotel to the beach to meet at Britto’s which is a restaurant right on the beach. 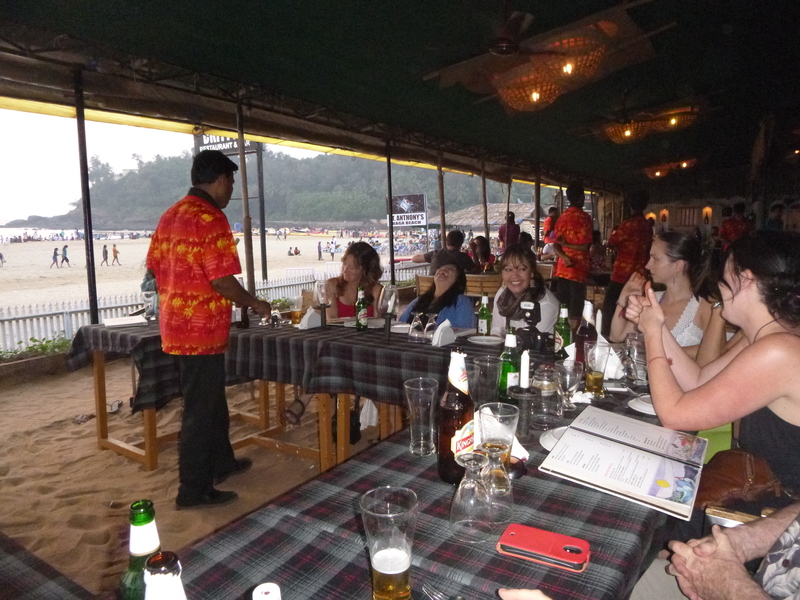 With a wooden roof and a plethora of tables and chairs, a “c” shaped table had been reserved for all 17 of us. The smell of the Arabian Sea wafted in—a subtle scent of salty sewer (we had heard that Goa has been known to dump sewage into the ocean), the sound of birds, people talking and music playing in the background and watching the waves rolling in onto the shore made me feel grounded—reflective. As I was one of the first people there, I decided to conduct a soundscape and placed my recording device on the dinner table. Here is a map that shows the Basilica of Bom Jesus and Britto’s where our Last Supper took place in Goa. I hope that you have enjoyed listening and sharing in my experience.